Greetings again from the darkness. Some people anxiously await the day they can retire and spend their days fishing or reading, while others put it off as long as possible since they find their identity through work. 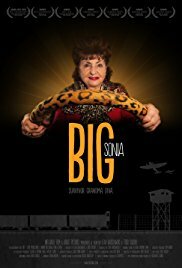 The diminutive subject of this terrific documentary is 91 year old Sonia Warshawski. Her reasons for maintaining a 6 day work week (and doodling) are both heart-warming and chilling, and make for a fascinating story. Filmmakers Todd Soliday and Leah Warshawski (Sonia’s granddaughter) do their part in allowing the charming and fiery lady to deliver her own message and recount the horrors of her childhood. Sonia is a Holocaust survivor. As a 13 year old in 1939 Poland, she and her family were taken. She never again saw her father or brother, took multiple beatings while being shuffled through 3 death camps (including Auschwitz and Bergen-Belsen), and ultimately watched her mother led into the gas chamber. In her own words, she says she “was in hell”, and it’s “a miracle” she made it out. You might assume that anyone who has experienced so much pain would be bitter and cynical, but that’s not Sonia’s way. In addition to running her tailor shop for 35 years, she is also an inspirational speaker at churches, schools and prisons. We get to see her in these presentations and we are struck by how her words carry such weight with the audiences – young and old. One of the convicts provides insight when he states, “It takes people who’ve been through something to reach those going through something”. We also witness the way she connects with teenage students … something most of us have little success with. Of course, Sonia has embraced her story, but the emotions and pain are never far from her. She stays busy to keep the memories at bay, and finds the idea of retirement somewhat frightening. We meet her 3 children and hear stories of their childhood and her husband John, also a Holocaust survivor. John died from Alzheimer’s complications, but he is remembered fondly by all. It’s so touching to watch as Sonia shows us her mother’s 75 year old scarf which she keeps under her pillow, and we are mesmerized as she recounts the incredible story of her liberation day. An NPR radio interview provides some structure throughout, but it’s not necessary as we would follow Sonia wherever she leads. It’s so much fun to watch her Overland Park customers greet her in the now-defunct shopping mall, and it’s downright hilarious as she sports her favorite animal prints on her coat, shoes and purse … and even the cover on the steering wheel that she can barely see over! Mostly this is a life lesson from a master who teaches us “don’t carry hate” … even though she admits to being unable to forgive. She leaves that to a higher power. She is the best example we could have for keeping history alive and spreading love and goodness. This entry was posted on Saturday, November 18th, 2017 at 10:54 am and is filed under Documentary. You can follow any responses to this entry through the RSS 2.0 feed. You can leave a response, or trackback from your own site.